Calc98 5.3 free download. 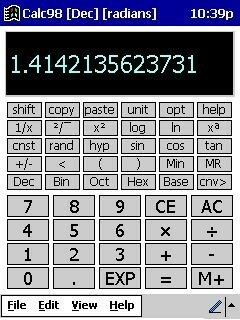 Calc98 is a pocket calculator simulator program for the Microsoft Windows operating system. It includes a comprehensive set of conversions, constants and physical property data, a built-in periodic table of the elements, number base conversions, vectors, matrices and complex numbers. It is especially designed for scientific and engineering users, students and teachers and it is also widely used in finance and medicine. The Periodic Table of Elements is a very useful educational tool for students, teachers and researchers in the chemistry field. UniConvert is designed to serve as a desktop tool for converting units, retrieving physical and chemical data and carrying out calculations with ease. Periodic Library is built to be an interactive periodic table of the elements. Periodic Table of the Elements is a free interactive periodic table program for MS-DOS. Periodic Table XP is a simple but effective digital version of Modern Chemistry Periodic Table. Periodic Table is a software that helps you at chimistry Get vast information regarding all the elements of the modern Periodic Table. Microsoft Calculator Plus allows you to complete many different types of conversions; it also includes all the mathematical functions offered in Microsoft Calculator.